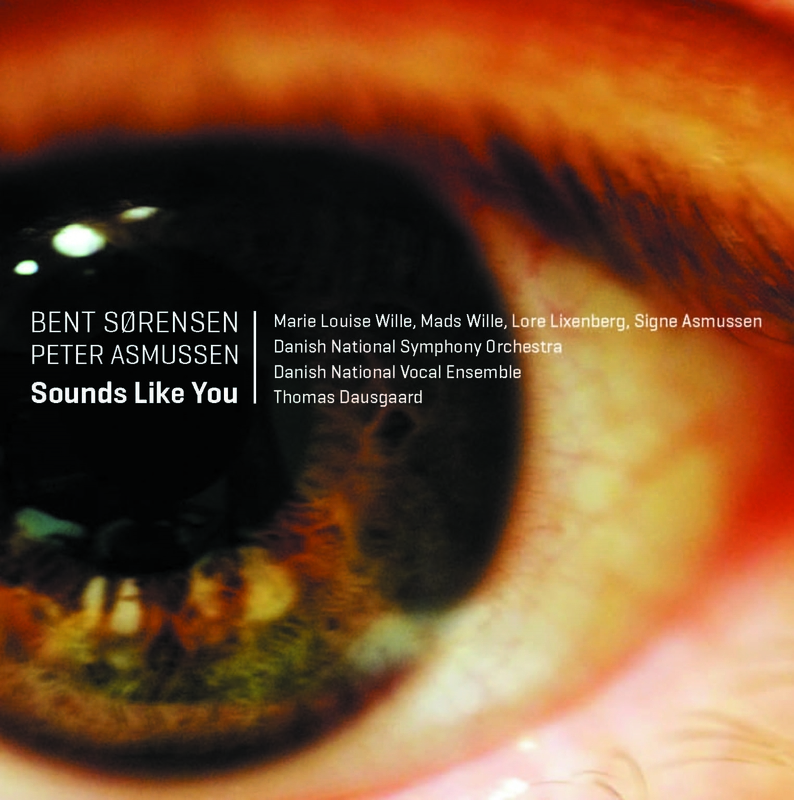 Bent Sørensen’s work Sounds Like You, with text by playwright Peter Asmussen, is a coupling of music and theatre, of orchestral work and drama, or in the composer’s own words: a theatrical play that has become an orchestral work and vice versa. The piece was commissioned by DR (Danish Broadcasting Corporation) in collaboration with the Bergen Festival and is here recorded in a live performance by the Danish National Symphony Orchestra, two actors and a selection of singers from the Danish National Vocal Ensemble under Thomas Dausgaard. On the CD, Sounds Like You is combined with Intermezzi, a five-movement suite for two mezzo-sopranos and orchestra, based on Sørensen’s and Asmussen’s opera Under the Sky. "Everything is subtly integrated and nothing is wasted, with form, flow and expressive shape all carrying us through a strange and not always comfortable world, but one in which we linger with singular delight. I sincerely commend it to your attention." "Sørensen pulls off a characteristic trick here: doing new, unusual and surprising things that manage entirely to avoid gimmickry." “It reminds me of something I’ve never heard!” – The remark comes from the Nor­we­gian composer Arne Nordheim as a reaction to a work by Bent Søren­sen, and it would be hard to imagine a more oddly apt description of the always-ambivalent expressive climate of the music of this one-of-a-kind composer. Oscar Wilde knew and described the experi­ence of “weeping over sins that I had never committed, and mourning over tragedies that were not my own. A past of which one has been ignorant, and fills one with a sense of sorrows that had been hidden from one’s tears.” In Sørensen’s work a similar weave of universally human experience is manifested in a multitude of ways. Not that his music is based on recycling: the musical idiom is entirely and exclu­sively of the present, aesthetically and technically, yet the music evokes memories of lived life and ancient dreams. Often fundamentally quite simple music appears in an intricate hall of mirrors where echoes and echoes-of-echoes spread like ripples in the water, are obscured by glissandi, or twist and turn in microtonal veilings. Quiet, effaced contours that can sound as if heard through falling rain or banks of mist, swirling half-shadows that dissolve just as they seem tangible; and yet all, tech­nically speaking, limned with scrupulous calligraphic precision. The capacity of music to create images has always given it a helping hand in relation to our ability to grasp it – would Beethoven’s piano sonata in C sharp minor have had the same career without moonlight? Sørensen’s music has sometimes had to wrench itself free of the loving, but also crushing embrace of literary inter­pre­tations; flickering associations have induced listeners to hear nostalgia, hyper-ro­man­ticism, indeed even pro­gramme music. And Sørensen’s fondness for the clas­sic ‘tonal’ intervals, the third and sixth, perhaps in itself evokes recollections of weathered musical family heirlooms. But his musical imagery is from the same family as Magritte’s famous painting of a pipe with the caption “This is not a pipe”. It is music, plain and simple, neither dream nor reality; it may evoke the basic processes of life – birth, growth, maturation, decay and death – but only refers symbolically to myths from the collective unconscious: bells, angels, echoes, shades, gardens, funeral processions, celestial trumpets, the lost innocence of child­hood. Bent Sørensen’s originality, imaginative sonorities and compositional skills have been praised ever since he had his breakthrough in the mid-eighties; his perso­nal mode of expression was formulated at an amazingly early stage. Quietly and with apparent ease he has since enriched and refined the self-mirroring canon technique and the suggestively beating pulse, not by leaps and bounds but soberly, steadily, almost methodically, like growth rings in a tree trunk. The confrontation between progression and stillness becomes ever clearer, weightless melodies appear in an echo chamber of several concurrent tempi, and his unique instrumental imagi­nation again and again finds orchestral colours that “remind you of some­thing you have never heard”. And a frequently occurring feature may come almost as a surprise: for long passages, his music seems limited to the treble register. Which is of course yet another paradox: melancholy and decay in scintil­latingly bright timbres? If anyone in the eighties had associated Bent Sørensen with the opera genre, most people would have shaken their heads. Despite the archetypal symbols – dying gardens, deserted churchyards, craquelured paintings, for­got­ten ruins – his music was at that time anything but illustrative. But in 2004 when his first opera was performed at the Royal Danish Theatre, this was no quantum leap, for in the meantime not only had rhythmically throbbing pulses and sharp contours appeared in his expressive repertoire, it had also become increasingly expansive and dynamic. And the elementary musical dramaturgy of far and near, the acoustic and expressive depth perspective that arises when musicians are placed in different parts of the concert space, attracted him again and again, presumably because it represented a similar depth perspective in his music. The Danish dramatist Peter Asmussen felt an elective affinity with the half-light of Sørensen’s music, and together these two artists of the same age ambitiously challenged the tradition-burdened opera genre. But Søren­sen would never dream of training his music to behave like opera; the only possibility was to get an opera to behave like his music. The result was that the ‘new’ Sørensen stepped forth in all his glory and conquered brand new territories, miniature forms adapted to the opera genre’s narrative mosaic of emotional states, relentless drama, intense presence and daunting unpre­dic­tability. All this comes together in the full-length opera Under the Sky, but the duality is still a basic condition; here present and timeless past envelop each other in two parallel stories which in the end seem to fuse together. The five Intermezzi are associated with that opera, but do not form a classic suite – they have arisen as an independent work along the way in the working process. The symmetrically organized movements, three with song and orchestra interrupted by two purely instrumental interludes, may well refer to emotional relations between the characters in the opera, but they do not refer specifically to its plot. And here too the half-light is evident at several levels: in the encounter between surrealistic atonality in one vocal part and almost folk-song-like simplicity in the other, in collisions between clashing dissonan­ces, fragments of children’s songs, folk-fiddler tones, in defiant meetings between wistfully humming calm and searing screams. In recent years Sørensen has become increasingly interested in more conceptual, boundary-breaking expressive resources, and in Sounds Like You for two actors, choir and orchestra the collaboration with Peter Asmus­sen has continued, now in a strange hybrid of concert hall and music drama. A woman and a man are placed among the audience; they start to speak, the light falls on them, and their dialogue can be heard from the speakers in the hall. At one point they rise and move both in the hall and among the musicians of the orchestra. They are entirely conscious, bodily present, they relate soberly and specifically to the here-and-now of the concert hall. But at the same time the intimacy of their relationship and the closeness of their voices make them unreal, somewhere between dream and reality. The members of the choir are placed around the hall, dressed as ordinary mem­bers of the audience, and the ambivalent situation is further underlined by the way the orchestral musicians at several points hum along, such that towards the end the choir singers themselves become a speaking audience, and the orchestral musicians leave the scene one by one and move out among the audience, where for some minutes hidden sound sources infi­nitely quietly echo Sounds like You. The dialogue between the man and the woman revolves around a fragile, hopeless love, originally related to a meeting in connection with an orchestral concert. It is like Chinese boxes, a mirror within a mirror: a man and a woman speak in a concert hall, they listen, just like the audience in the hall, but who is listening to whom? Who are the performers and who the listeners? Are the couple themselves listening to the music that is playing right now, or does it rather express their thoughts, memories and conflicting emotions? Do their mental states mirror the music or do they speak through it? Are the spoken words a triggering factor for the music, or are they all just ... at a concert? This multiplicity of meanings is of course toned down when one listens to the work on CD, But Bent Sørensen’s music is so rich in intrinsic musical value, so lyrically pervasive and rhythmically stimulating, dissonant and tonal, caustically biting, dark, yearning and captivatingly dancing, and Asmus­sen’s raw text about the impossible possibility of love is so charged with gloom, doubt, hope and desire that the experience of this major work can of course never be limited to people with a valid ticket to a concert hall. Here we are in the cinema of the ears. The composer Karl Aage Rasmussen is Professor Emeritus of Composition at the Royal Academy of Music in Aarhus. He has also held many other posts in Danish cultural life and is the author of several books on music and musicians.